These two siblings came into the studio a few months back to commemorate their first birthday and boy did we have fun. Not just one adolescent boxer, but two! And not just any boxers, these are Texie and Ranger who have their Instagram account (texieandranger.boxers) and hundreds of followers! Dad was dubious we'd get anything usable, mom was committed to making this happen and off we set. They did great, and things did get a little crazy from time to time, but the resulting images won over everyone's hearts. Texie's personality is larger than life and she's got one of the best head tilts in the business. Ranger is big and handsome and takes things a bit more seriously. That's what mom calls it when they mirror one another and it happens all the time. We all lost it when we saw these images, they were literally successive frames and their mom said that these reflected their individual personalities perfectly; Ranger being serious and Texie a bit more freewheeling. With so many great images to choose from, too many to hang on the wall, Texie and Ranger's mom added an album to her wall art purchase so she could enjoy all of the images from the session; check out this video of her seeing it for the first time. Tracy Allard of Penny Whistle Photography is a Certified Professional Photographer with the organization Professional Photographers of America; a designation held by fewer than 2,500 photographers nationwide and a hallmark of consistency, technical skill, artistry and professionalism. 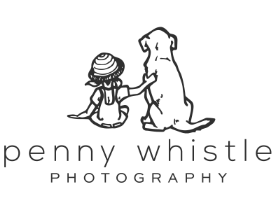 Penny Whistle specializes in both natural light and studio photography providing engagement, child, family and pet portraits as well as corporate headshots and commercial photography in her studio located in old town Carrollton as well as out on location in Coppell and surrounding communities in Dallas – Fort Worth, Texas. Leta Parker - Soooooooo cute!!!!!!!!! !